Missing Link is a cute enough adventure with incredible visual effects; that unfortunately fell short of my high expectations. Laika Studios achieves mediocrity with their fifth feature film. The pioneers of stop motion animation are victims of their own success. Missing Link sufficiently entertains, but isn't in the realm of Coraline, ParaNorman, and Kubo and the Two Strings. Everything they've done has been so creative, a sideways step was inevitable. Missing Link feels perfunctory with overly dry humor. It definitely raises the technological bar, but isn't as inventive as their previous works. 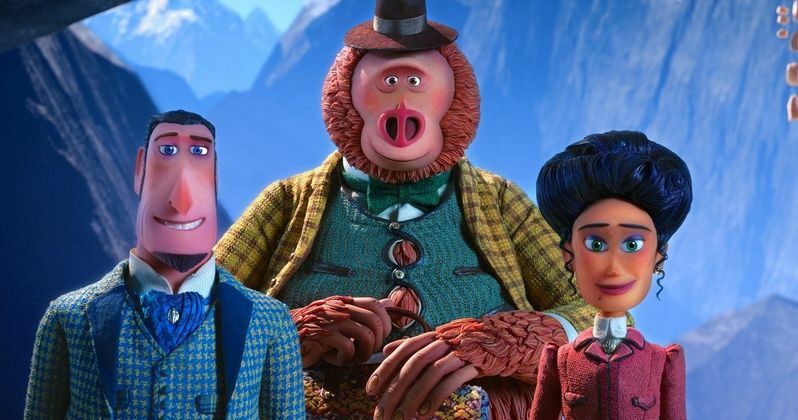 Missing Link begins with the famed explorer Sir Lionel Frost (Hugh Jackman) searching for a legendary beast. His expedition runs into a few problems. He is forced to return to Victorian era London empty handed. Sir Lionel's greatest wish is to be accepted into the stodgy, but esteemed Optimates Club. He is constantly ridiculed and rebuffed by Lord Piggot-Dunceby (Stephen Fry), a snobby chauvinist who rejects modern thinking. Sir Lionel receives a mysterious letter from the American west. It guarantees proof of the fabled Sasquatch. Sir Lionel demands entry into the Optimates Club, if he can bring back proof. His trip reveals the entirely unexpected Mr. Link (Zach Galifianakis), a gentle, avocado-shaped, accident-prone creature. Sir Lionel is surprised by Mr. Link's intelligence and request for help. He has been terribly lonely, but has an idea of where to find others like him. Mr. Link, Sir Lionel, and his recently widowed ex-girlfriend, Adelina Fortnight (Zoe Saldana); embark on a globetrotting quest. Little do they know that Lord Piggot-Dunceby has dispatched a fiendish hunter (Timothy Olyphant) to stop them. Children will enjoy the pratfalls and overt gags, but much of the humor is too sophisticated for them. Missing Link has subtle, dry dialogue that is meant for adults. This includes racier jabs at sexism, racism, and elitism. Chris Butler's script tries to be too witty in this regard. The film should have concentrated more laughs towards to the younger audience. I understand that Butler wanted Missing Link to be more substantive for adults, but feel he went overboard. The humor is too divided for age groups. My thoughts are to aim the majority of laughs towards kids. This is foremost a children's movie. If done correctly, parents will laugh as well. Let me state again that Missing Link is entertaining and worth seeing. My standard for Laika films are stratospheric. I expect greatness because they've achieved it multiple times. Missing Link is a middling entry in their catalog. At the very least, it's cool eye candy that never becomes busy like the Lego films. Missing Link will be distributed by Annapurna Pictures.